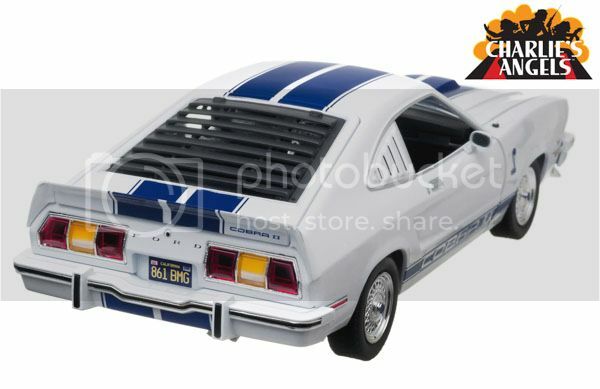 Indianapolis, IN (September 2013) – For those who grew up with the Angels, there is no mistaking the 1976 Ford Mustang II Cobra II. With its blue racing stripes that could be seen for miles, this car was all style and class. 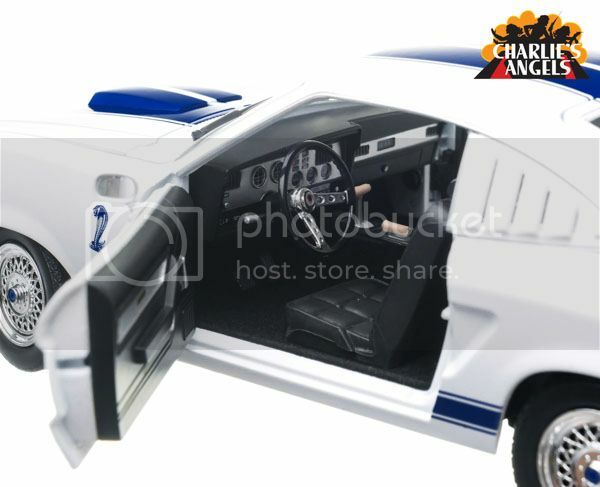 Our 1:18 Charlie's Angels 1976 Ford Mustang Cobra II features all the bells and whistles - TV correct license plate, decoration and, like its real TV counter-part, it is missing the grill's Cobra emblem, not seen until season 5. You'll also find black-wall tires on our model. 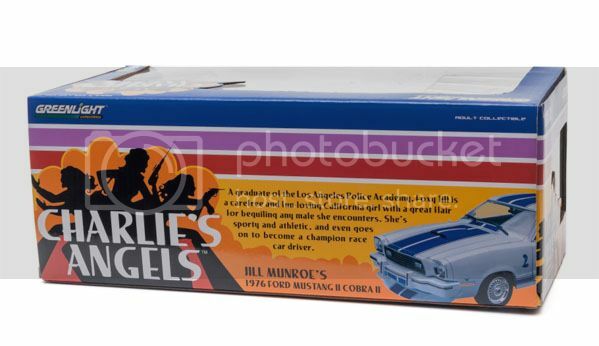 Rather than pay royalties to the tire company, the producers of Charlie's Angels opted to switch the tires so they did not show the factory correct tires with raised white lettering. 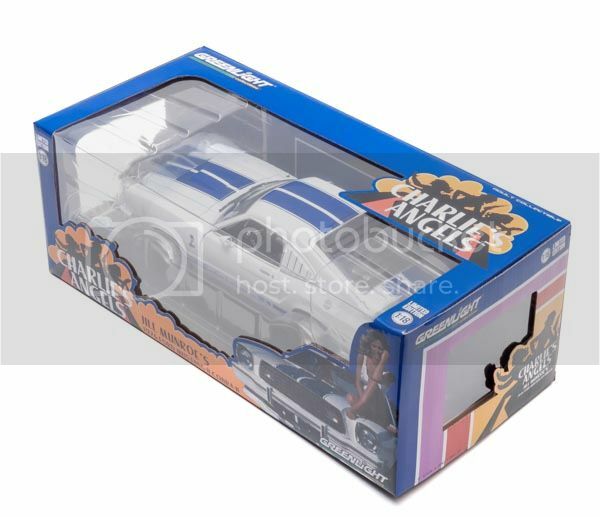 Any Hollywood car fan would be hard-pressed to miss this release. This show chronicles the adventures of 3 gorgeous detectives working at a private investigation agency for Charles Townsend, a mysterious millionaire who never shows his face. Due to the popularity of “Charlie's Angels,” it was the first show to break the $100,000 per minute barrier for advertising. At one point, the series received 18,000 fan letters each week in the US! The hair style worn by the character "Jill Munroe" was so popular that a large percentage of America's females began wearing "Farrah Fawcett Hairdos." Sony Pictures Studio's rich history can be traced back to 1918 when brothers Harry and Jack Cohn formed a partnership with their associate Joe Brandt, to produce low-budget short films and featurettes. They called the company CBC Film Sales (Cohn-Brandt-Cohn- or as it was more commonly known in the trade press, "Corned Beef and Cabbage"). By 1920, the film industry was attracting audiences of 35 million a week willing to pay five cents a pop to be drawn into the magical world of filmed entertainment. Meanwhile, down the road in Hollywood, Columbia Pictures got its start, bringing pictures like It Happened One Night and Lawrence of Arabia to life. Columbia Pictures officially moved onto the studio lot in 1990 after its acquisition by Sony Corporation; and the rest is history, as they say.